Maggi So Juicy Review. Does it Really Make Your Chicken Juicy and Flavorful? Another great dinner tonight thanks to BzzAgent! The latest Bzz campaign I got to try out tonight was Maggi's So Juicy seasoning and all I needed to add was chicken. 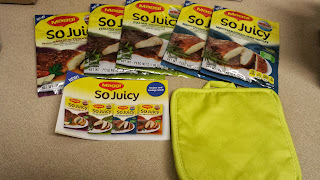 I received 5 free packages of different flavored seasonings to try out, several coupons so I can buy more at my local Kroger store, and also a free yellow pot holder. Maggi's So Juicy comes in flavors Savory Garlic & Tomato, Italian Countryside, and Mediterranean Herb Medley. Tonight I decided to use the seasoning Mediterranean Herb Medley. The seasoning comes with a cook bag and tie already inside the package. The ingredients are maltodextrin, salt, potato starch, garlic, corn starch, rosemary, sugar, onion, yeast extract, sage, natural flavors, tomato, spices, citric acid, sunflower oil, and turmeric. Also, a good thing to know about Maggi's seasonings is that there are no hydrogenated oils, and no added MSG. What I used: 8 pieces of raw chicken tenderloins, less than half a bag of frozen California Style Vegetables (Broccoli, Cauliflower, and Carrots), less than half a red and green bell peppers, less than half a white onion, a glass oven safe pan, and one bag of Maggi's So Juicy Mediterranean seasoning. 1. 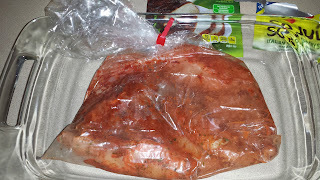 Put the raw chicken in the cooking bag along with the Maggi's So Juicy Seasoning, tie it up and shake. 2. Put tied bag in a oven safe glass pan in oven on 350 degrees and let cook for about 45 mins. 3. While chicken is cooking, cut up the red and green bell peppers, and cut up the onion, then sit it aside. 4. When 45 min has pass, take the chicken out the oven and let it sit for 2 to 3 mins. (This avoids hot steam hitting your face when opening the bag. 5. Cut the bag open and pour the chicken and juice in the pan. 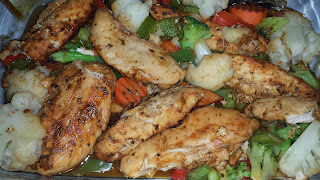 Now, start adding the cut up vegetables and the California Style Vegetables in the pan with the chicken. Stir the vegetables so the seasoning can blend in with the vegetables. 6. Lower the heat in the oven and place the pan back in the oven for about 5 mins. 7. Now you're ready to eat! Mmmm...that chicken tasted so good and juicy! No need for a knife to cut my chicken since it was so tender, all I needed was my folk and it just split in half easily. My significant other thought the flavor reminded him of curry chicken and it brought back memories of when his mother use to make it. Is Maggi's So Juicy Worth a Try? I really did like this seasoning, very flavorful and my chicken came out tender and juicy. It made cooking so easy since I'm not the greatest cooker in the world. I'm really looking forward to using the other flavored seasonings and I may start using seafoods with this seasoning as well! Sounds delicious, and love the fact that it was so easy! I believe it does Cookie.